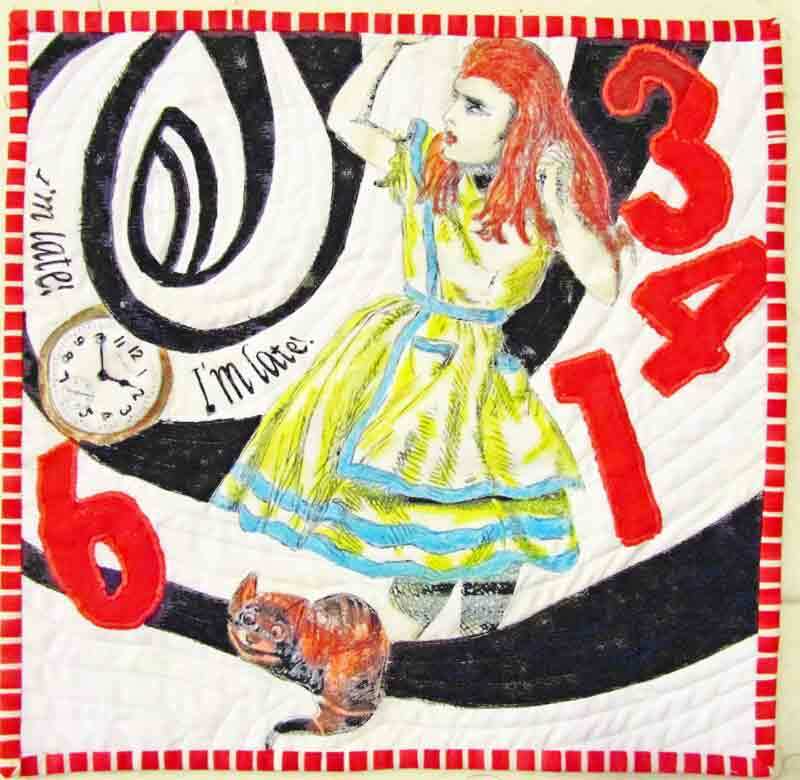 The Art of Quilting | In the Crayon Patch.. I have participated in a few quilt challenges in the half dozen years I have been quilting, and the ones I like best are the ones where I do something completely different from what I usually do. I am most inspired in my quilting work to work in colour, and love making pieced quilts. But for a few of the quilt challenges I have taken a different path, and made an “art quilt”. I am a huge fan of Quilting Arts magazine, and have also purchased several DVDs of Quilting Arts TV. I love looking at the innovative materials and techniques that quilters use to make these works, so here was my chance to try them. The first art quilt I made was part of a “tin can” quilt challenge. I had the fabric for ~6 months, and dropped by the quilt shop that was running the challenge to see if they had more of the fabric. I thought I had a week to go, but in fact it was due in 2 days. Well! 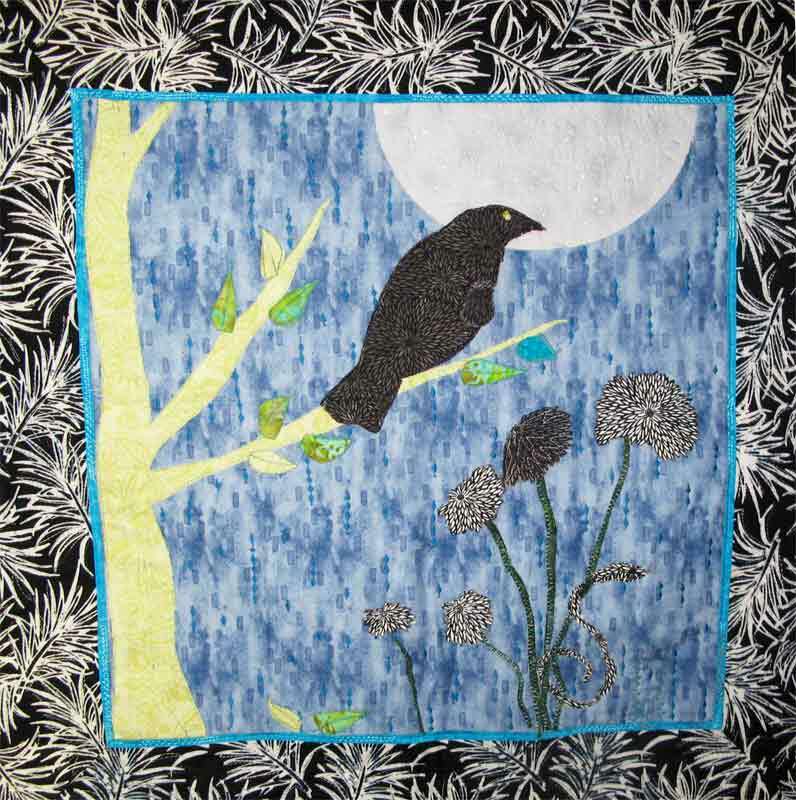 The challenge fabric was the black and white fabric used to make the flowers and the bird- I think the short time frame made me try things I normally would not have, and I was pretty happy with how it turned out. I used marker pen to make some of the challenge fabric all black (used for the bird), and used a lot of the embroidery stitches on my Janome Gem Platinum (brand new then!) in the quilting. The next year, my quilt guild (York Heritage Quilters Guild) had a challenge- the theme was to be It’s a Small World. There was a size restriction of 120″ for the perimeter. Well, I am fascinated with the wild and wonderful world of insects, so this was an easy one of me. I won second place in the beginners category (never entered, never won), and got to try a variety of techniques to transfer designs to fabric. This is when I discovered Leslie Riley’s Transfer Art Paper, which is now available through C&T Publishing. I did a lot of reading about leaf cutter ants, initially drawn to photos of tiny ants carrying leaves many times their own size. this became the inspiration for my quilt, which I named It’s a Small, Small World. 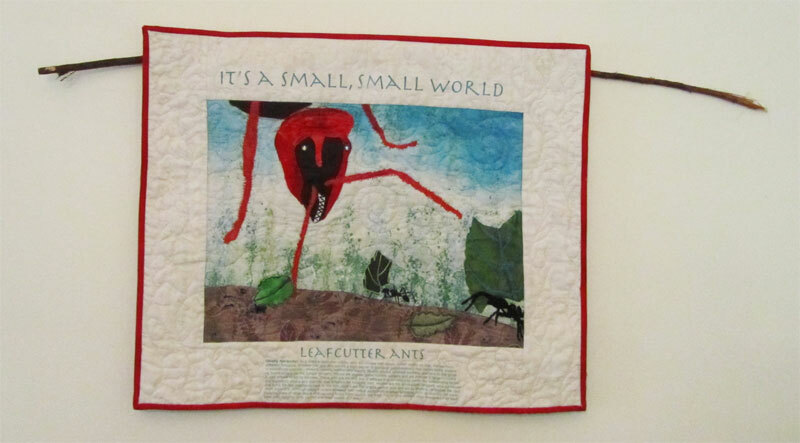 In the left side of the quilt border, if you look very closely, I printed ” And I think to myself, what a wonderful world”- a phrase from the Louis Armstrong song that moves me every time I hear it. The most recent quilt I made (finished this morning!) is to be donated to our Guild for its silent auction at the upcoming quilt show next month. This past June I went to see the ballet of Alice’s Adventures in Wonderland, a co-production between Britain’s Royal Ballet and the National Ballet of Canada. This was a stunning production, one I would love to see over and over again. The magical set design was my inspiration for this 12″ square quilt. I just might have to bid on it myself in order to keep it! I do love the freedom of play that I have when I make these quilts, so there may be more art quilts in my future. But right now I have a charity quilt to quilt and bind, a Christmas table runner to finish, and a host of other projects that are demanding my attention. What’s a girl to do?